Friendly and tame. Does not respond to name but will chirp in response to a whistle. 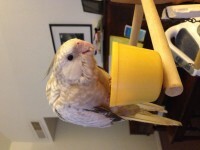 It is my daughter’s bird. My dad lost it when we were on vacation. Reward.